Walking last night in my new neighborhood, I smiled at passing cars, picked up trash, and spied out the woods and pond across the street, hearing red-winged blackbirds colareeee to each other from among the cattails. Dust quickly coated my toes a gritty grey, and a speeding pick-up truck sucked birch saplings after it, and rattled a glassy green energy drink bottle among the pebbles. I grabbed the tiny glass bottle, seeing beauty in its potential, a vase in the making. 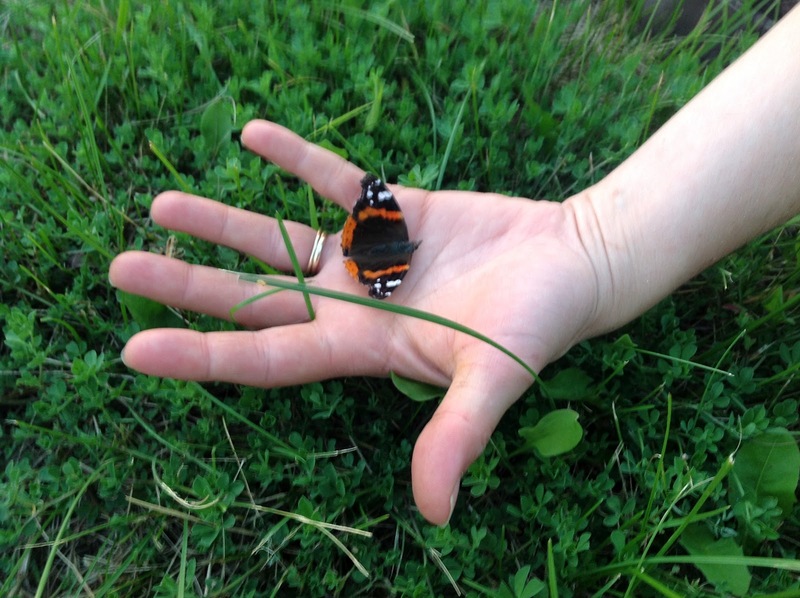 Orange and black butterfly wings frozen in death nestled between common plantain broad leaves. An array of curled, wrinkled pages suddenly grabbed my attention. 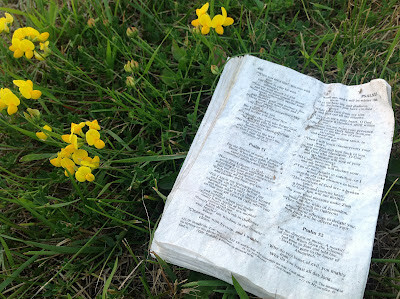 Scattered across the grassy ditch fluttered fragments of an entire Bible. Samuel, Kings, Psalms, the pages were sandy and crimped from days in the sun and rain, but the words were still legible. How did it get here? Did it fly out a car window? Did a bicyclist throw it away from winding wooded paths? Was someone curious, worried, fearful, angry? I gathered words, lifted fragile wrinkled pages, assembling a thick stack. Cradling a frozen-in-time butterfly beauty in one hand, and a timeless manuscript and glassy green bottle in the other hand, I walked. In Africa, my parents told of a Muslim man who had had dreams of Jesus (Isa). Wanting desperately to know whether the Allah of the Koran or the Jesus (Isa) of the Bible was the true God, he prayed to both, asking them to show him. "If Allah is God, then get me a Koran," he said to no human aloud. "If Jesus (Isa) is God, then get me a Bible." He told no-one of his quest and waited. Sitting down beside his tree at lunch-time, he found a Bible. His journey for truth continued. In my own melodramatic manner, I walked my muggy street last night, praying for a stranger, knowing that God is big, and he is good. He knows their story and the intertwining threads being woven. I simply obey him and pray when he tells me to. Nearing the end of my road, I turned around to start home. A crimson sun dipped low on the horizon, exploding pink and tangerine across the sky. Hi friends. I appreciate you here. Have you had a time when you felt God telling you to pray for something or someone? smiles...that is pretty cool....often when i am walking i will pray the names on the mailboxes...i like the story of the man getting his bible too...smiles. Oh, Jennifer, I love this post! Your prayer is SO beautiful, and I love how God put you there in that moment. Beautiful, beautiful. Stories like this always lift me higher.